As of 1:00pm Central Standard Time, the See (seat) of the Diocese of Rome is vacant, and we have no Pope. 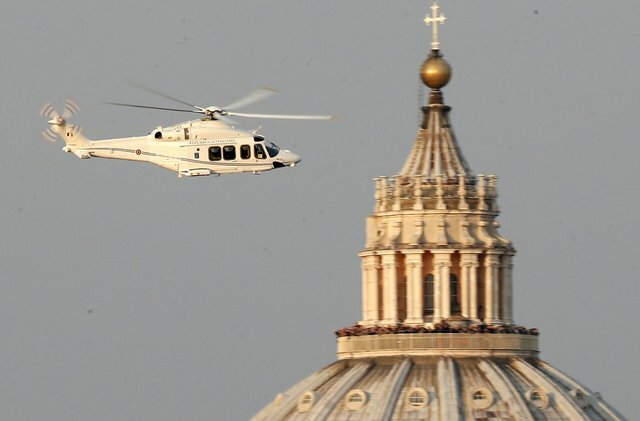 Benedict XVI, who will now be known as Supreme Pontiff Emeritus, departed the city of Rome this morning via helicopter for the papal villa in Castel Gandolfo, about 30 kilometers southeast of Vatican City. And then, at 8:00pm in Castel Gandolfo, in front of the papal villa, the Swiss Guard departed from their post and ceremonially gave the duty of protecting the pope to the Vatican police, and the Diocese of Rome became sede vacante, a “vacant see (seat)”. You can watch this changing of the guard in this video (the event happens around minute 8:45 and continues for a few minutes after that). Perhaps you could offer a prayer in thanksgiving for the holy and beautiful eight-year reign of Benedict XVI, pope emeritus, sometime today?